License, which permits unrestricted use, distribution, and reproduction in any medium, provided the original work is properly cited. ration. New diagnosis of pneumonia within 3 days occurred in 2/55 of the feeding group and 4/33 of the fasting group. 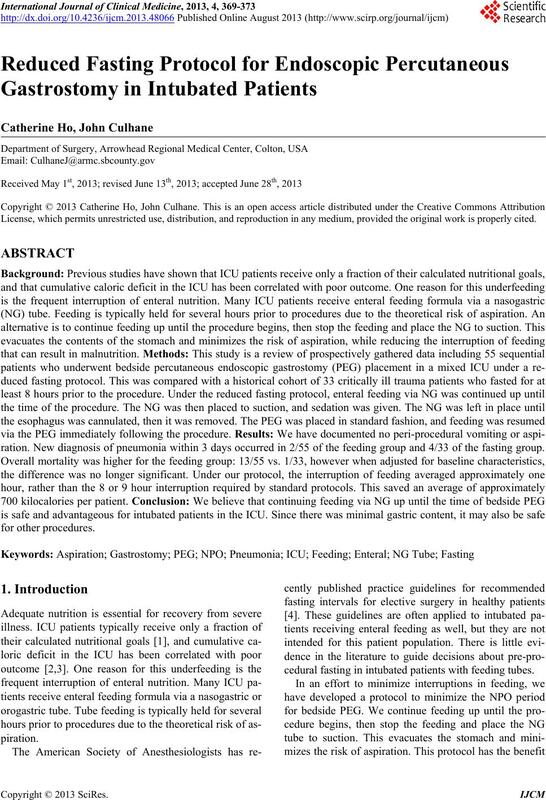 cedural fasting in intubated patients with feeding tubes. This study is an analysis of prospectively gathered data. dure. These patients compose the feeding group. patients compose the fasting group. new pneumonia during this time period. for other reasons and were included in the fasting group. sibly increasing risk to the patient. however we believe this is due to baseline differences. not significantly higher than that of the fasting group. need a PEG are more likely to survive to discharge. death for every patient in the feeding group who died. Pneumonia 5 months after the PEG was placed: 1.
ration, which theoretically could have led to pneumonia. pneumonia or chest x-ray changes for the feeding group. to cancellation and rescheduling of procedures. but there is evidence that underfeeding may be harmful. procedures, including extubation and tracheostomy . tubated patient is still debatable and varies in practice. 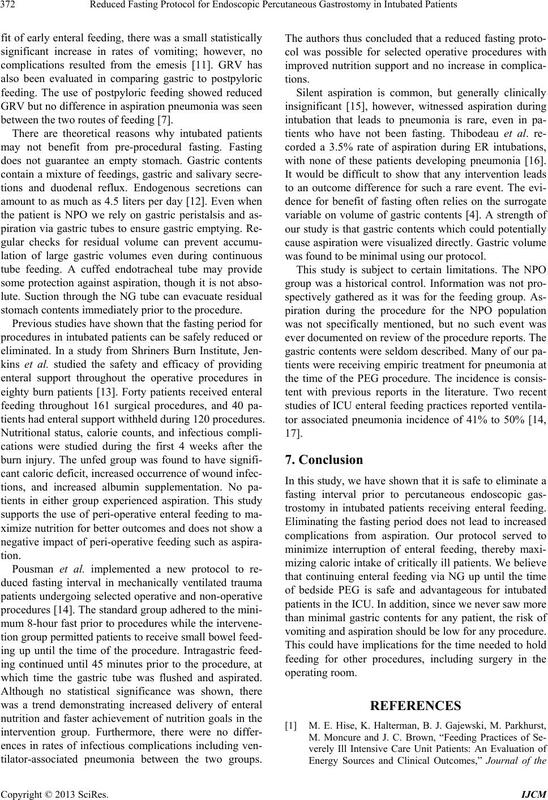 ing intervals for elective surgery in healthy patients . most patients in critical care is 25 to 30 kcal/kg/24 hours. between the two routes of feeding . stomach contents immediately prior to the procedure. tients had enteral support withheld during 120 procedures. which time the gastric tube was flushed and aspirated. tilator-associated pneumonia between the two groups. with none of these patients developing pneumonia . was found to be minimal using our protocol. 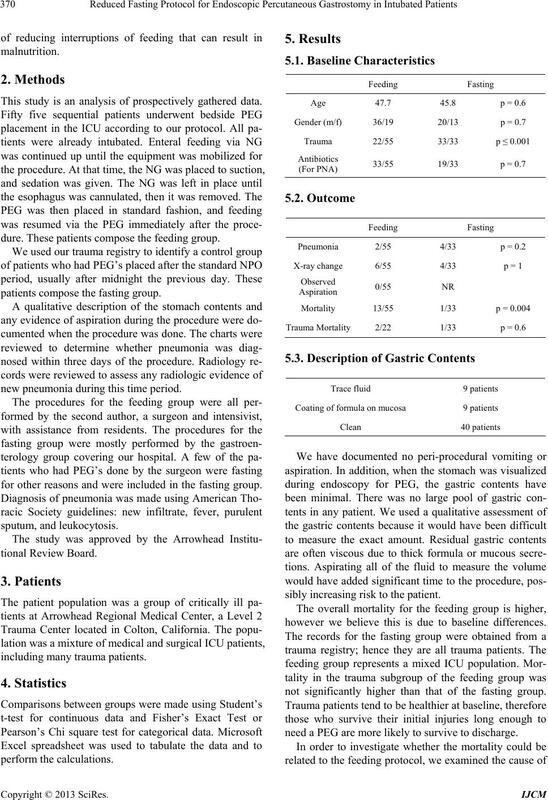 trostomy in intubated patients receiving enteral feeding. vomiting and aspiration should be low for any procedure. American Dietetic Association, Vol. 107, No. 3, 2007, pp. Vol. 24, No. 4, 2005, pp. 502-509.
monia,” Chest, Vol. 140, No. 5, 2011, pp. 1254-1260. C. S. Doig, P. T. Heighes, F. Simpson, Sweetman and E.
Enteral Nutrition, Vol. 27, No. 5, 2003, pp. 355-373. J. A. Schneider, Y. J. Lee, W. R. Grubb, J. Denny and C.
Vol. 37, No. 7, 2009, pp. 2299-2302. K. K. Kattelmann, M. Hise, M. Russell, P. Charney, M.
Association, Vol. 106, No. 8, 2006, pp. 1226-1241.
cal Association Journal, Vol. 12, 2010, pp. 543-548. Injuries,” Journal of Burn Care & Research, Vol. 15, No. R. M. Pousman, C. Pepper, P. Pandharipande, G. D.
enteral and Enteral Nutrition, Vol. 33, No. 2, 2009, pp. No. 4, 1978, pp. 564-568. 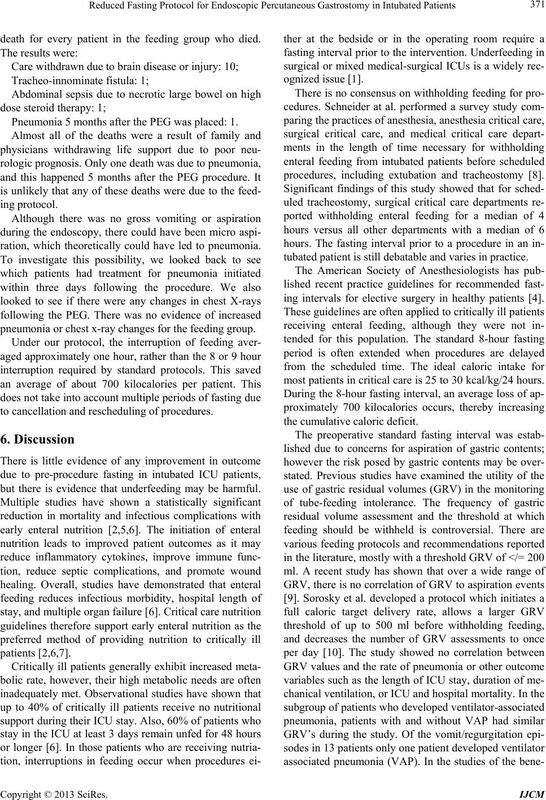 Journal of Emergency Medicine, Vol. 15, No. 6, 1997, pp. J. B. A. MacLeod, J. Lefton, D. Houghton, C. Roland, J. 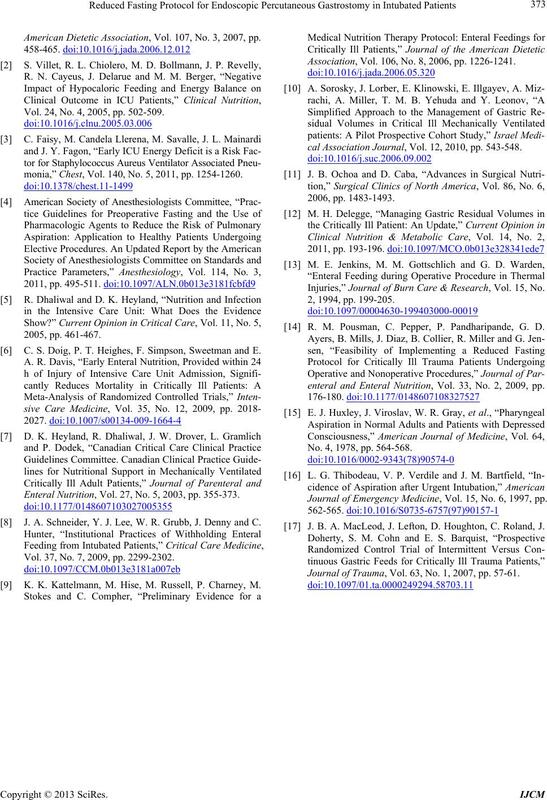 Journal of Trauma, Vol. 63, No. 1, 2007, pp. 57-61.